Buick is a brand of General Motors in the United States, Canada and China. It is sold in North America, China, the Commonwealth and the Middle East. The sign of Buick is the famous "Three Shield". The basic pattern is a circle contains three shields. 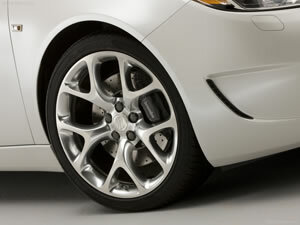 As a well-known brand, Buick wheel rim has its own unique design. The wheel rim adopts the lead precursor braking way. At the same time the front Buick wheel rim suspension type is McPherson independent suspension. The multi-link independent suspension is the rear suspension type. This Buick wheel rim is made of steel. Wuxi Hengsheng Wheel Co., Ltd is a professional Buick wheel rim manufacturer and supplier in China. In addition to Buick wheel rim, we also provide other famous models steel wheel rims for our clients around the world, like Lexus wheel rim, Lincoln wheel rim, Mazda wheel rim, Mercedes wheel rim, Volkswagen wheels rim, Mitsubishi wheel, NISSAN wheel, OLDSMOBILE wheel, etc. We possess a professional technology team to guarantee the manufacturing of Buick wheel rim. We will checkout all the products and give out a survey report. According to the needs of every client, there will be a dynamic balance sample survey among parts of the qualified Buick wheel rim.